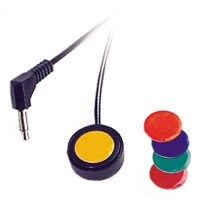 The Candy Corn Proximity Sensor Switch is designed specifically for users who have minimal movement and/or strength. Unlike other switches which require actual contact or pressure to activate, the Candy Corn switch relies only on the user being in physical proximity to the switch surface, thus making it much easier for those with motor control issues to use. Exact placement or the hand or finger is not necessary as the Candy Corn Switch will activate if any part of the body comes within 10 millimeters of the switch surface. 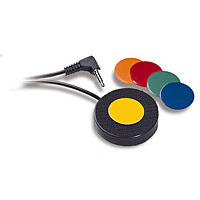 With both auditory and visual activation indicators this switch will be of benefit to a wide range of users. The StealthSwitch3 Programmable USB Switch Controller from H-Mod provides users with a means of transferring or reducing the heavy workload which the hand and fingers encounter in daily computer use. Mouse clicks, keyboard shortcuts, and multi-key macros can be programmed and triggered by foot pedals or many other types of switches. Other common applicatons of the StealthSwitch3 Programmable USB Switch Controller include a wide variety of gaming functions, photo booth triggers, transciption control, etc. With the StealthSwitch3 Programmable USB Switch Controller multiple switches can be connected to a CPU through a single USB port. The StealthSwitch3 Programmable USB Switch Controller is truly universal, fully programmable, and easy-to-use with both the Windows (including Windows 8.1) and Mac OS-X platforms. 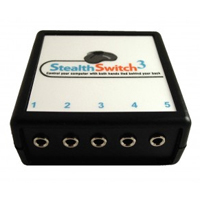 The StealthSwitch3 supports up to 5 external switches (available separately) , and the number of accessible commands can be can be raised to 8 by using Shift mode which uses one switch to enable the other switches to access an alternate set of commands. Switches can be programmed to send keystrokes, mouse clicks, double clicks, drag lock, hotkeys, or macros (maximum of 4 keystrokes per macro). The StealthSwitch3 is fully programmable using the downloadable drivers. Once it is programmed, all settings are stored in the switch interface hardware so no software or drivers are required, even if you move the unit to another computer. This is especially convenient where deployment is intended on limited access systems, as programming can do done by loading the software on another computer which is not subject to these restrictions. Multiple configuration files can be created and stored for later access. MAC users receive a bonus benefit from the RoboCon program which automatically re-configures the switch interface based on the current application, allowing the setting of application-specific command layouts. It may be used with any of the StealthSwitch II Slave Footswitches, or for other options check out our range of switches in the Switches category. The StealthSwitch Tripod Slave Footswitch is an accessory footswitch for use with the StealthSwitch3 Programmable USB Switch Controller or any other Controller or Switch-activated device. The unique design of this switch means that it can be activated from any direction, unlike traditional "pedal" stype foot switches that activate from a specific direction. Activation notification is provided by a distinct but reasonably quiet click in combination with the tactile response of the switch. 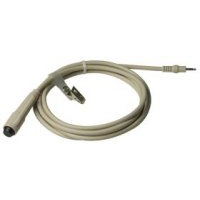 Made of ABS plastic, this footswitch has a 6' (1.8 m) long cable that terminates in a 1/8" (3.5 mm) mono plug and requires about 0.0625" (1.6 mm) to activate. NOTE: The StealthSwitch FS-1 Slave footswitch provides no functionality on its own. Command functionality can only be accomplished by connecting this to a programmable Switch Controller, pre-programmed device, or Switch-activated device. This switch is a smaller version of the Cup Switch. It features a 1.0" activation surface with 8 mm travel distance and requires a 9 oz / 255 grams of force (above average amount) to activate. It includes 5 stickers to allow the user to use whatever high contrast color they desire (Red/Blue/Yellow/Green/Orange). The Savant Elite2 family of programmable USB devices is available in configurations supporting up to four switches. These switches can be used to reduce the strain on the fingers by offloading repetitive actions such as mouse clicks or keyboard shortcuts to alternate means (either one or both feet, non-dominant hands, etc.). Programmed to function as modifier keys (such as Shift, Ctrl, or Alt) the switches can also help to maximize productivity by allowing the user to continue typing without interruption and to access the modifiers near-simultaneously with the feet. 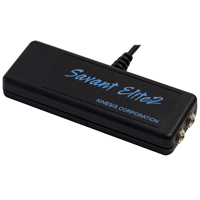 The Savant Elite2 Control Module from Kinesis Corporation is a programmable interface which can accept input from foot pedals, assistive switches, or hand triggers. It is ideal for situations where there may be a need to have multiple switches spread over an area or where there is a desire for the smallest possible pedal footprint beneath a workstation. The 9.6 foot long USB cable also permits the control module to be positioned at a distance from the computer. Two models of the Savant Elite2 Control Module are available. 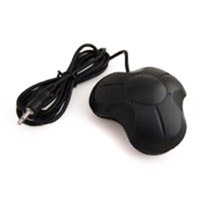 One features 2 input jacks for attaching the external switches and is pre-programmed to perform left and right mouse clicks. The second model is equipped to accept up to 4 switches and/or pedals and is preprogrammed to perform the left and right clicks as well as Backspace and a "Thank you," macro. Of course, these can easily be reprogrammed to the specific needs of a user. The Savant Elite2 Control Module also has driverless programming for a wide range of operating systems, including Windows, Mac OS X, Android, Linux, or Chrome. Modules come preloaded with Windows and MAC versions of the SmartSet App, a visual programming interface to facilitate quick and simple programming in either of these environments. A simple text editor and be used to program for other alternative operating systems. Check out our range of switches in the Switches category. The Single Pedal Accessory for Savant Elite2 is an add-on pedal that must be connected to a programmable (jack-equipped) Savant Elite2 Foot Pedal or to a stand-alone control module. (i.e. the accessory pedal is not programmable and has no control module of its own.) 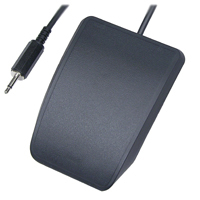 When connected, the Single Pedal Accessory can be used to generate any command assigned to the associated jack, such as mouse clicks, combination keyboard shortcuts and multi-key macros. An additional pedal provides access to a greater number of commands and functions, and allows the user to further reduce the load on the hands and fingers. The accessory can be positioned up to ten feet away from the control module. The Single Pedal Accessory for Savant Elite2 has a low-profile housing and is hinged at the front, enabling the user to rest the foot on the pedal with minimum risk of accidental activation. The pedal also features independent tension adjustment to allow the user to personalize the degree of activation resistance, and threaded inserts and adhesive velcro tabs to secure it in place. X-Keys Orby Switches from PI Engineering offer users a low (100 g) activation force with a clearly audible click for notification of both activation and deactivation. The 2.5" diameter surface activates the switch from any contact location and is large enough to provide a significant target zone without being two large for practical placement. 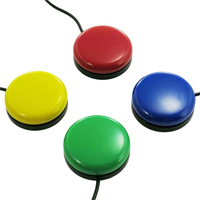 The brightly coloured (Red, Yellow, Blue, and Green) buttons are highly visible and lend themselves to serve as visual cues to aid in identifying the command to be performed. Orby Switches connect to any control module or switch-adapted device that accepts the industry standard 3.5 mm plug. For stability Orby switches feature a non-slip backing or can be secured using the dual threaded brass inserts. 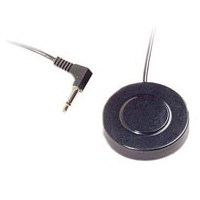 This hand trigger is equipped with a mini-phono plug and a 8 foot long cable. It is intended to connect to a jack-equipped Savant Elite foot switch (FS20AJ-USB or FS30AJ-USB) or to a stand-alone control module (FSMJ2-USB or FSMJ4-USB). Applications include tasks where both foot and hands need to execute repetive tasks. The Savant Elite device may be configured so that the hand trigger duplicates a foot pedal action, or adds an additional action.